The project was highlighted in the news: “School children to leave mark on Atlantic” in the Jamestown Press (a local Rhode Island newspaper). These boats are the first boats out of Rhode Island for Educational Passages! 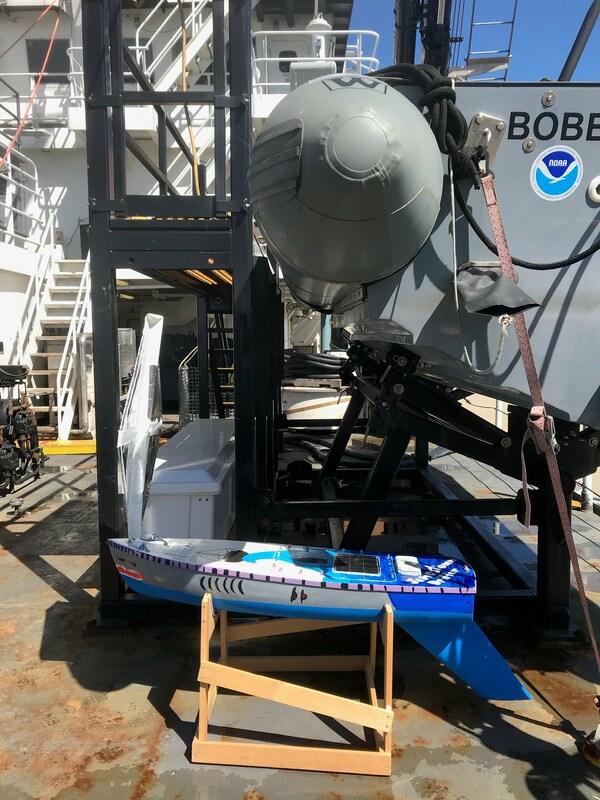 The Jamestown Drifter was handed off to the crew of the R/V Henry Bigelow, a NOAA vessel heading out for bottom trawl surveys later this week. 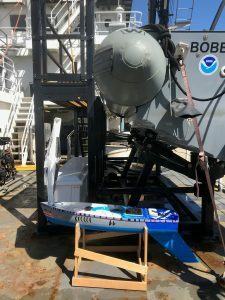 They were planning to take the miniboat out and hopefully launch her near the Gulf Stream at some point during their cruise, but the EP crew noticed some issues with GPS transmissions and are going to bring the boat back to the shop to see what’s going on. The Bigelow leaves again May 1 so we’ll be aiming for deployment then, if not sooner! 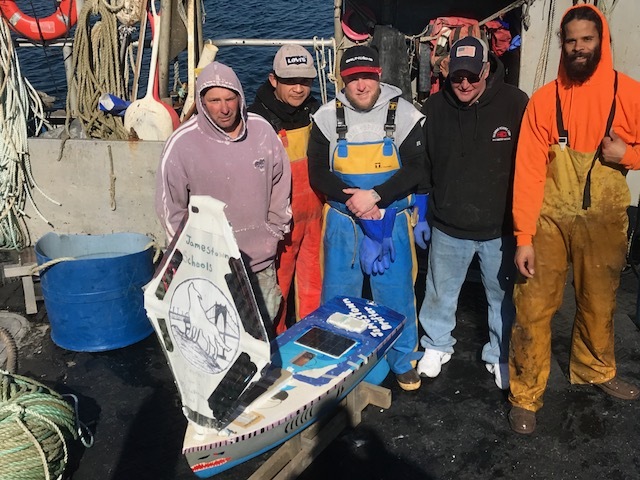 Nearly a year after students at the Lawn School began assembling and preparing the Jamestown Drifter, she was finally brought out to sea south of Martha’s Vineyard in mid-February 2019. 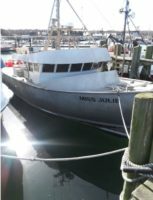 Longtime lobsterman Bob Colbert out of Sandwich, MA loaded the miniboat on F/V Miss Julie, one of his three offshore vessels. 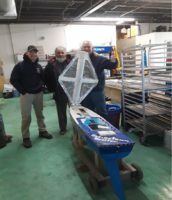 Special thanks to Jim Manning (pictured in the middle photo) who spent countless hours troubleshooting the sensor package on board. Thanks to Captain Colbert and his crew who launched the Jamestown Drifter on February 16th. 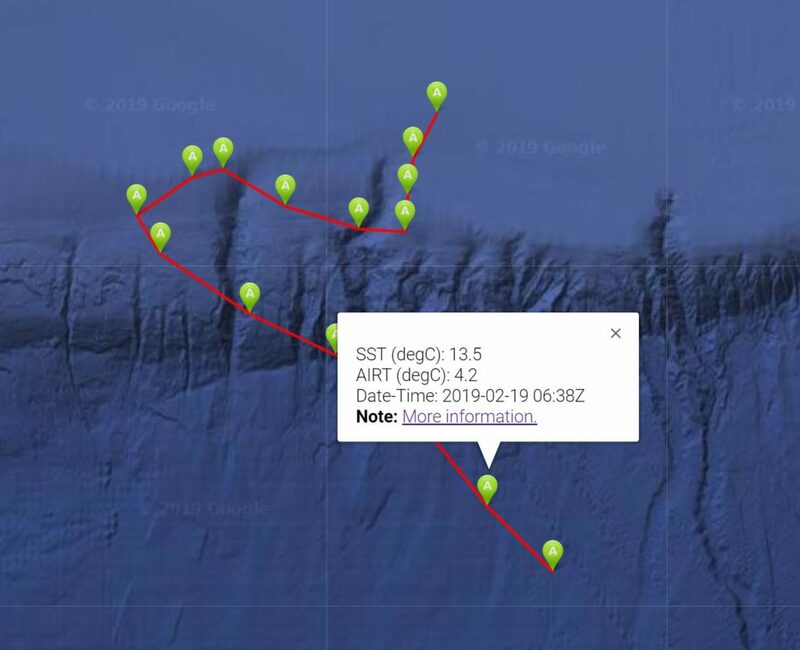 She rode the “shelfbreak current” to the west-south-west for the first day and then headed out to the deep water ocean, all while collecting and sending us back air and water temperature! This boat has air and water temperature sensors. To access the data directly, click here and search for “192410681”. To see the sensor data on a map, click here. 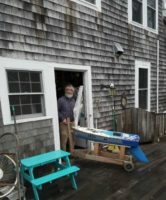 Conanicut Island Sailing Foundation (CISF) has a goal to spark student curiosity through hands-on learning and expose them to their local marine ecosystems. 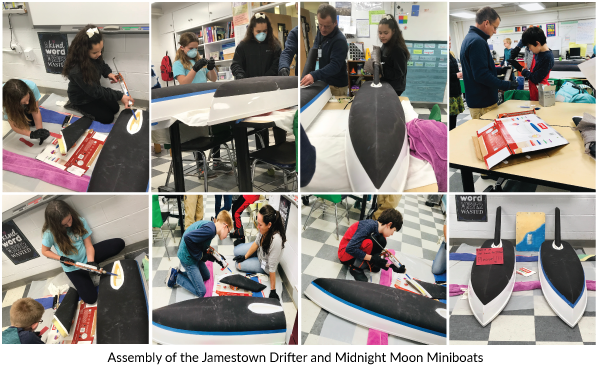 They were awarded a grant from 11th Hour Racing to run in-school programming during the 2017-18 school year with miiboats (and other projects) at Jamestown, Rhode Island public schools (elementary and middle schools).